Below is a summary of the study, commissioned by CPS Energy and performed by the Electric Power Research Institute. Published on March 31, 2014, the entire report may be downloaded here. As part of the development of the Advanced Metering Infrastructure, commonly known as the smart grid, CPS Energy will be deploying revenue meters (smart meters) with two-way telecommunication capabilities that utilize radio-frequency (RF) transmitters. Various individuals and organizations have raised health and safety concerns regarding potential adverse affects on humans due to exposure to the electromagnetic (EM) fields generated during these radio transmissions. 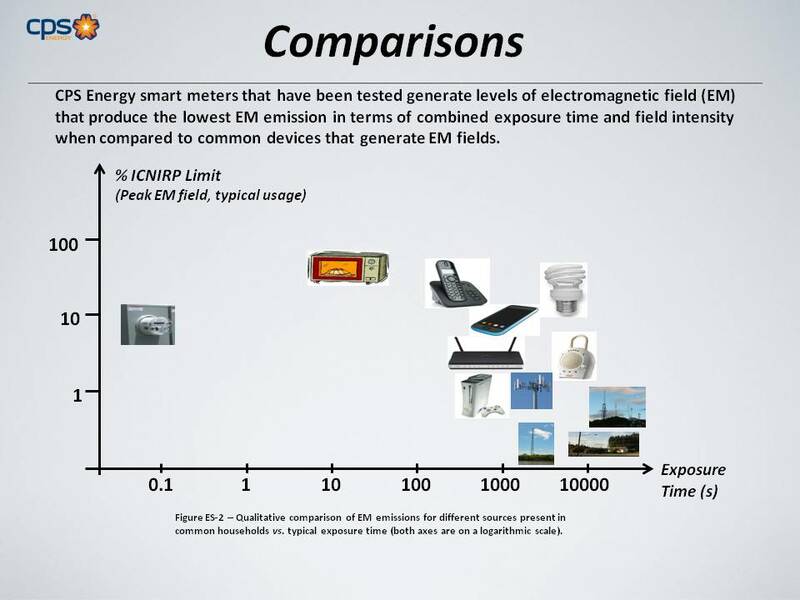 While numerous existing studies show that the EM exposure of smart meters is well under safety limits as defined by both government and independent agencies, CPS Energy commissioned a data collection and analysis study to provide a quantitative description of the RF emissions specifically from smart meters being deployed in the CPS Energy service territory. This study was designed with CPS Energy customer concerns and safety in mind by analyzing the specific models of smart meters installed or planned for in CPS Energy’s deployment, taking measurements in current residential installations, and performing laboratory smart meter testing. From the data presentation perspective, the basic information is presented such that the greater public can easily understand it. At the same time, the study maintains a scientific rigor by providing reproducible and accurate results. Technical details are presented in the report appendix. This transparent presentation provides skeptics with a step-by-step instruction manual, complete with reference citations, to recreate the study for themselves. A primary objective of this study is to provide the proper context for the interpretation of the data. This effort was focused on presenting the EM emissions in the radio-frequency (RF) range from smart meters in comparison with other common devices that are generating electromagnetic fields and to which the public is routinely exposed. The determination of the radio emission effects on humans (and living organisms in general) is still an open research issue, especially in relation to potential non-thermal and long-term exposure effects. Analysis and conclusions from an epidemiological perspective are outside the scope of this study and are being actively pursued at the international research level. An important aspect of this research was the choice of the proper metric to quantify and compare the technical findings. 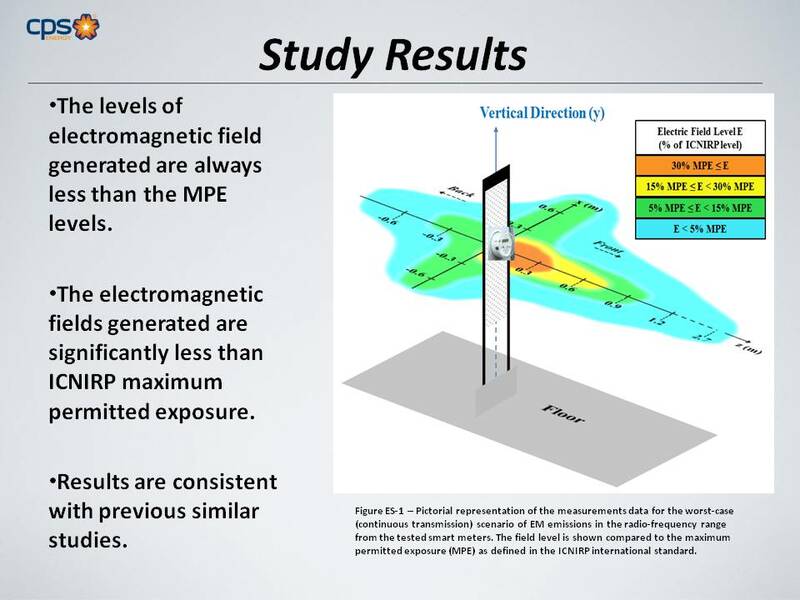 In order to provide a dataset that would find both immediate and longer-term utilization, the assessment of the level of electromagnetic emissions is always referred to by its primary physical quantity, the “electric field amplitude” rather than the more commonly utilized “average power density.” This choice allows both a direct comparison with current published safety standards and with research findings that may become available in the future. CPS Energy requested that the study focus on worst-case scenarios where the radio frequency emissions are continuous rather than the more realistic intermittent pulses. This perspective addresses the effects of any “defective” units that are not functioning normally, or an interconnected system of meters communicating with one another to reach a single hub. A synthesis of the results is shown in Figures ES-1 and ES-2. Figure ES-1 provides a pictorial representation of the electric field intensity from the smart meter RF emissions worst-case (a continuous emission measured in the vicinity of the transmitting antenna). Figure ES-1 is a qualitative drawing of a contour map representing the actual measured field level as a function of distance from the meter. The field level is expressed as a percentage of the maximum permitted exposure (MPE) according to the most conservative international standard, published by the International Commission on Non-Ionizing Radiation Protection (ICNIRP). Figure ES-1 refers to a horizontal cross section plane, located at the same the height from the ground as the meter, where the maximum level of emissions has been found. Figure ES-2 provides a comparison of EM emissions from smart meter radios with respect to other common EM field sources. The plot is constructed by graphing the electric field amplitude expressed as percent of the ICNIRP maximum permitted exposure (MPE) limit (as in Figure ES-1), while typical exposure time is presented on the horizontal axis. EPRI’s study found smart meters emit far lower levels of radio frequency than other common household appliances. for any possible exposure conditions are always less than the maximum permitted exposure (MPE) levels specified by the ICNIRP safety standard. This comparison holds in the most unfavorable conditions where the pulsed emission level is compared with the level allowed for a continued exposure over a period of six minutes. for typical consumer exposure in residential operating conditions, are one order of magnitude less, or lower, than the ICNIRP maximum permitted exposure (MPE). These results are also consistent with previous similar studies. produce the lowest EM emissions in terms of combined exposure time and field intensity when compared to common devices that generate EM fields. Further comparisons with published standards in terms of EM power density, a derived quantity utilized for the definition of the Specific Absorption Rate (SAR) in the ICNIRP limits, yield an even more favorable outlook in relation to the short-term, thermal effects on humans due to the EM emissions generated by the set of smart meters that have been tested. The download link directs me to the EPRI main page. Is this intentional? Where can I download the report?